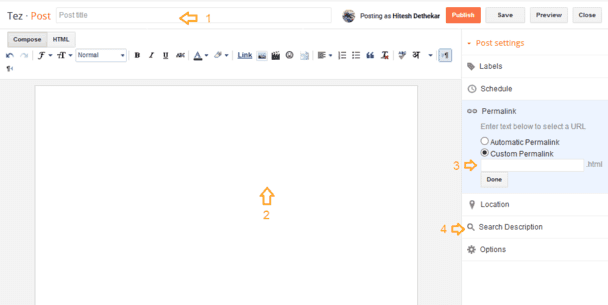 How to write and publish your post on Blogger? Basic Information. Friends, you learned in our previous post What is Blogging and How To Start Your Blog ? And Manual on Blogger Custom Domains: How to enable the HTTPS SSL? 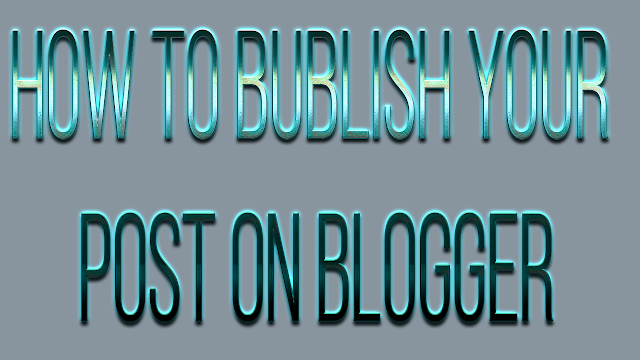 This post will tell you how to write and publish your post in Blogger? This is the problem of all the new Blogger, how do you write the post? This is a very simple task. With this, I will tell you today, when you publish a post on Blogger, you have to take care of some things.You have created a blog, but unless you post regularly, your blog will not have good traffic and you will not be able to earn money from blogging. While writing a post, keep in mind that your post title, url and post are SEO friendly.So that search engines could understand your posts and your readers also benefit from your post. While publishing posts in Blogger, you have to take care of some of the things mentioned below. Title - You have to write the title of your post. You have to write the title of the post in a way that reader can understand after reading what the post is about so that your readers can read posts. Post - Here you have to write a post. Post You do not have to copy or paste any other's post or else you will not get adsense and the chances of becoming your post rank in google will become zero. You do not copy-paste the post in your own way. Permalink / Url - Here you have to write short descriptive url. Search Description - To see this option in the Post Editor, click on Settings >> Search Description >> Meta Tags >> Yes. Here you can add a meta description of your blog post. Lables - Here you can add category. If you want to add a post to a specific category, then you can type the name of that category here. As you have a recipe blog, and you share the recipe of eating veg and non-veg in it. So you can use category / label in such a way. That means whenever you click on user veg recipe / non-veg recipe, you will find blog posts containing all veg recipe / non-veg recipes from your site. Your post will go to the blog after clicking on the publish button. So friends in this post we learned how to post in blogger?Before writing a post, decide which ones you want to blogging on the topic. So that you could understand the topic well and share the post on your blog.